No matter where I live or what I do, the people I call friends do not look like they could grace the pages of a Brooks Brothers catalog. Never did I think, though, that I'd make friends with someone at a bar by happenstance that would later let me tag along for a little adventure in bee keeping. Once I arrived at the house where the hives are kept, the first thing my friend and his business partner did were prepare the smoker, which is a method to keep the bees from stinging. Bees have an instinctive fear of fire, so when you blow smoke their way they will naturally engulf themselves with a crop full of honey that they store in a special stomach. Carrying around all that honey, they will find it more difficult to bend their abdomen to use their stinger. Not to point out the obvious, but it is way better to be around bees who aren't really able to sting...especially when you are you are outnumbered by a few hundred. Grasping hive tools, we walked down to the end of the yard where the hives were residing, misting the air with smoke as we approached. The closer we got the more you could see the massive amounts of bees entering the bottom of each hive and flying around the general area. 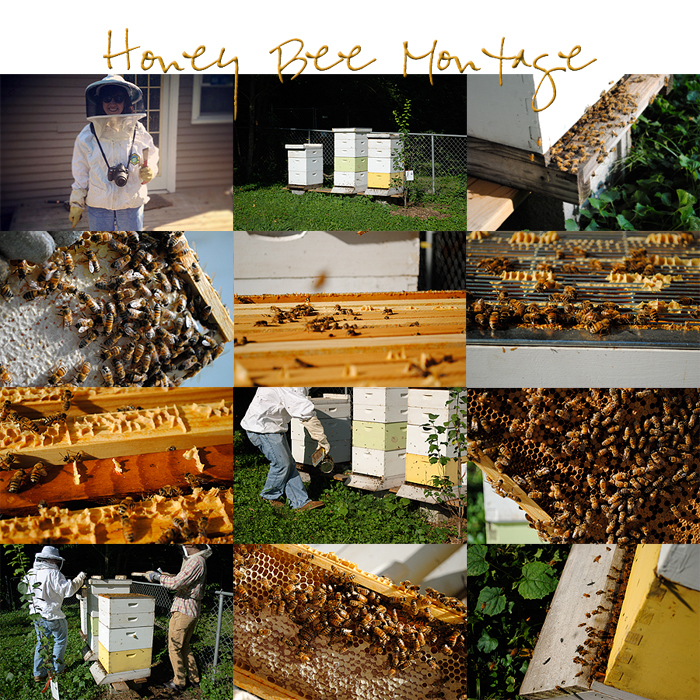 Each of the three hives they have is considered an individual colony, with their own respective queens, worker bees (female), drones (male), broods and honeycombs. 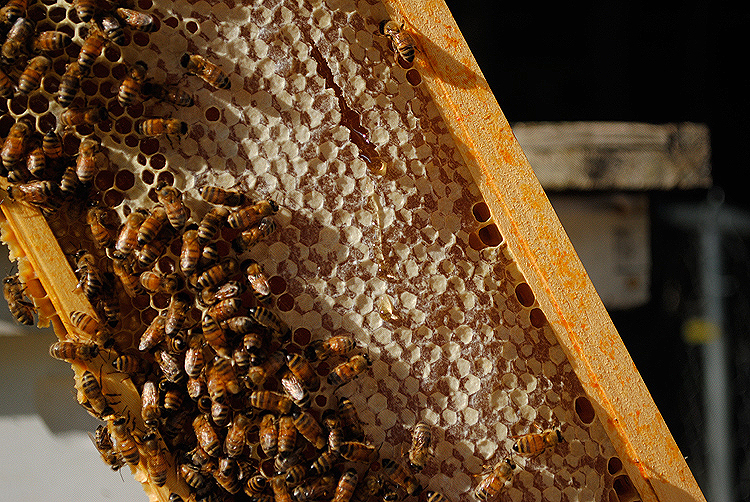 Each section of the hive serves a specific purpose and each of its bees has a job to do. As the two of them began to lift off the top of the first two hive boxes, I noticed that more bees started aggressively buzzing near me. While I was protected by a hive suit, it was hard not to instinctively start to shoe them away or run and take cover. The idea was to not make any sudden movements are bother them more than necessary. 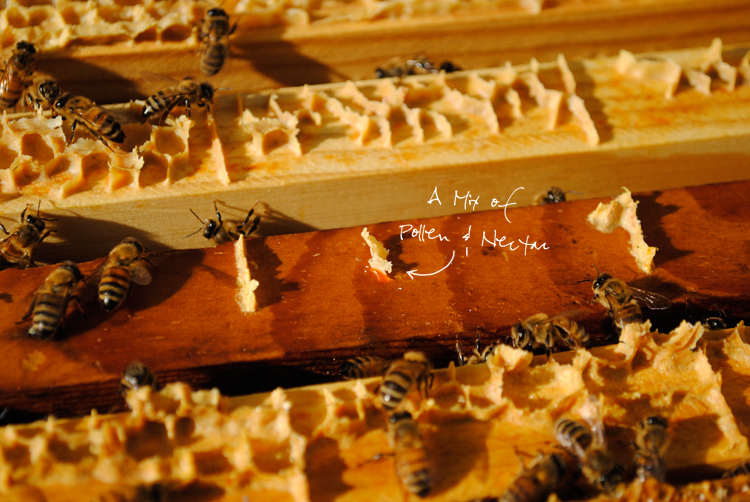 Under the top is where the hive bees were found hard at work creating honeycombs on individual frames lining the box. As my friend slowly lifted one of the honeycomb frames for inspection, and it was like nothing I've ever seen before. There was portions of the frame that looked like a work of art - small cells of honey holding honey in each and then covered by a white wax. In cells that were not yet capped with wax, hive bees were busy filling those with nectar and pollen that had been brought back to the hive by the field bees. The fun didn't end there, though, folks. Since my friend wanted to check on the brood, he offered to show me those frames, which were located in the center of the box under the honey frames. It is in this area that the queen hangs out laying eggs....lots of them. 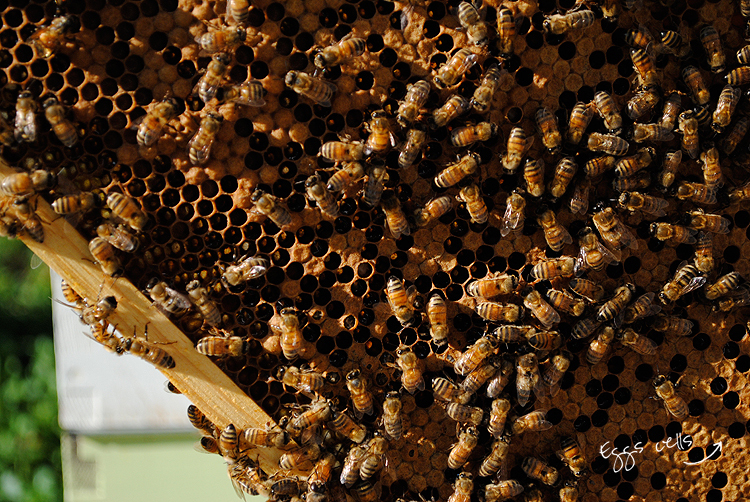 The brood area of the hive looked just like the honeycomb frames, but instead of worker bees filling them with honey the queen is filling them with eggs. 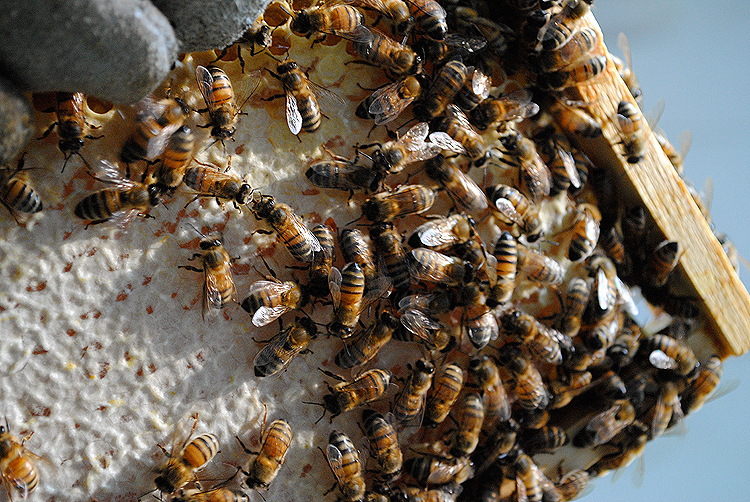 Depending on the type (queen, worker or drone), the period from egg to emergence is between 16 and 24 days. From there they begin a life of work - queens will live 2-5 years; workers will live for 1-4 months; and drones will live a mere 30-50 days (not ideal to be a dude bee). After killing some small African hive beetles who make meals off bee larvae, we moved on to take a look at the third hive. When the lid was first removed I immediately noticed that there were less worker bees present and the ones who were there working were way more mellow than those of the other hives. A bees temperament is due in large part to the type of queen running the hive - this one must have been less pushy than the others. As we began to inspect the honey frames of this hive, we found that these were 100% capped with waxed and ready for extraction. I guess you don't need an intense group of bees to have a productive hive. Being that I had managed to get up close and personal with the two other hives, I figured I'd help in bringing the capped honeycombs up to the house. However, it isn't as simple as removing the frames and waltzing on up. Producing honey is the life of a bee and robbing their hive is not something they take lightly - even Pooh Bear could tell you that much. After removing a capped framed from the hive, several bees flew off while others kept right on doing their honey making thing. My friend explained that since bees do not like carbon dioxide, I would need to blow on them to remove them from the frame. So there I was, blowing on some bees, pants tucked into a pair of borrowed stripe socks and not thinking that perhaps this could end badly for me. Yup. I got stung. The moments that followed were that of intense pain - and a rambling of curse words. This was all followed by lots of swelling and itching, which lasted approximately three days. It was a sad day for my foot and that pissed off honey bee, but at least I left with some free honey (and a bag of ice). Just one more reason to have mad respect for a bee keeper, and why local honey tastes that much sweeter. So...do you buy local honey or just stick to the plastic bear bottles in the condiment aisle? All pictures taken by The Solution Girl - Adventure courtesy of Risky Beesness.